A group of interviewees are answering questions from interviewers for a job overseas in Seoul. To be successful in the USA, you must have the job-search tools and the know-how to compete head-to-head successfully with an American applicant. If you plan to go to the USA as a temporary-worker, you must prove to American immigration that you are not replacing the talents of an American worker and that no other American worker could do what you do or wants to do what you do. The most critical element of your US job search is knowing which industries you are most likely to be hired. However, as technology envelopes the American workplace, some of the traditional good jobs' that overseas workers were previously able to secure in America are in less and less demand. 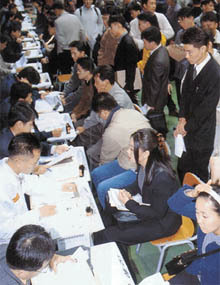 According to the US government's own Department of Labor website, jobs sectors such as farmers, garment sewing machine operators, private household cleaners, typists and word processors, bookkeepers, accountants, audit clerks and bank tellers have already been in decline, and will continue to stagnate to the point of offering limited job opportunities in the years to come. These employment positions have deteriorated as world industries harmonize their labor force needs and rely on the computer or outsourcing to do the work once accomplished in the United States. Needless to say, you probably shouldn't look to America for this kind of work. Instead, do your homework and open an atlas. 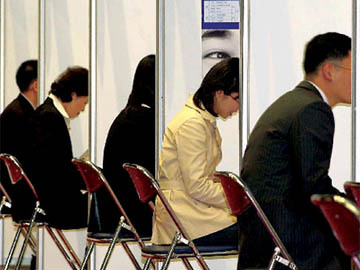 The key to getting to America faster is by finding employers that truly need you. You should determine which US states are in desperate need of your type of experience. Do some research on hot or in-demand jobs, and which fields are in rapid expansion mode and cannot get enough people to feed the demand for talent. In the 1990s, for example, there were never enough computer programmers to fill the jobs when the dot-com boom hit. Looking to start up as fast as possible, employers offered higher paying wages, flexible work schedules and even stock shares in the company to attract as many applicants as possible to fill the jobs they instantly created. Many people quickly went back to school or changed their majors to learn programming and capitalize on the industry's urgency. Alternately, there are occupations that are experiencing a serious void of employees due to the popularity or lure of higher-paying jobs in other states or bigger cities. There are crucial jobs that remain open in small towns for long periods of time due to the fact that qualified Americans would rather work closer to state capitals or to the financial centers on the east or west coast. Each state has a distinctive industry employee shortage that begets the necessity for international workers and the jobs that go unfilled by typical Americans could be yours for the asking. But things are changing in small town America, too. Bigger companies are starting to pop up in small towns due to the tax breaks and incentives offered by State commissions to attract industry to impoverished regions. Companies get to build bigger production plants or head offices, free of the usual zoning red-tape that comes in bigger cities, and in turn, the area residents are offered employment. Still, there's technical and skilled employment that the local population cannot easily satisfy. This is also where your resume may find favor. Look for employment trends state-by-state through the Internet or at your local library. If you would like more information about current USA job news and more effective insider tips for landing a job in the USA, please visit www.americajobnet.com. Sacha DeVoretz is an established author and international career consultant. She is also the founder and president of Americajobnet.com, publisher of international employment self-help manuals. She can be reached at sacha@americajobnet.com or Tel: 1-604-992-0880.